Bruce Edwin - The Hollywood Sentinel: Julie I want to begin at the beginning. Most people that know of you, know of course your legendary role in TV's Batman, as Catwoman- of course, but you began, what many may not realize, way before that, in many other TV shows and films. Also I have learned that you were a dancer. Julie Newmar: Well, that's why Catwoman worked! I always thought it was not (being) appreciated in films - for my dancing, but almost the opposite thing happened. As an actress, having (also) been a dancer, the part of Catwoman worked superbly. The Hollywood Sentinel: I definitely agree. Julie Newmar: Or if you're a bird, They give you a costume as a bird, and you're right from the get go! Julie Newmar: When I was nineteen. Hollywood Sentinel: Nineteen years old! And you were a choreographer? Julie Newmar: Yes, A dancer and choreographer. Julie Newmar: Yes, much more done in the past than now a days. Julie Newmar: For someone almost six feet tall, you could say that it took off! Hollywood Sentinel: (laughs), So you ended up on Broadway, can you tell us about that? Julie Newmar: Yes, I started in Hollywood, because I was born in the Hollywood Hills, Los Feliz, not far from Disney, as a matter of fact, my father built a house there, I grew up there, in the hills, looking out at the Pacific Ocean. Hollywood Sentinel: And you studied dance? Julie Newmar: Yes, as a dancer I studied almost every form of dance available for someone living in America. Hollywood Sentinel: What really made you want to begin in dance and acting? How did you begin? Julie Newmar: My dear, my beautiful, my darling mother who was unable to finish her career as a dancer- she was in the Ziegfeld Follies, on Broadway, gave me all the opportunities that were not possible for her, which is how most people's stories are, right? Hollywood Sentinel: Wow! And you were what age when you started all these classes? Hollywood Sentinel: That's amazing, and at nineteen you were doing choreography for Universal Studios, and when did you end up on Broadway? Julie Newmar: When I was nineteen actually, early twenties, I had done 'Seven Brides For Seven Brothers' (as Dorcas Gailen with MGM) for Michael Kidd (choreographer), and then took that money, and bought a plane ticket and went to New York - didn't tell my parents- and luckily started out right away on Broadway, so the second thing I did was Lil'Abner, for Michael Kidd (first the hit Broadway Musical, and then the film version for Paramount, as Stupefyin' Jones). Hollywood Sentinel: O.K. And what was it like for a young women back then in Hollywood, we hear today of imbalances of race or gender, what was it like for you back then as a young woman? Hollywood Sentinel: Right, so you had the foundation, and knew what you were doing. Now in the schooling you had, they obviously taught the art, but did they teach the business too? Did you learn the business side of the industry in classes in school or did you have to learn that on your own? Julie Newmar: No not at all, only the art, you just floated in our own realm, and you hoped someone noticed you! Hollywood Sentinel: Wow. Did you have many agents when you were beginning to get all these jobs? Hollywood Sentinel: (Laughs) Around what time did you get your first team of people representing you? Julie Newmar: Oh dear, I remember his name was Shurr, his brother was in Hollywood, and Louie Shurr was in New York, and he saw a seven foot poster of me in front of the Saint James Theatre, when I was performing in Lil' Abner as Stupefyin' Jones, and he said, "Ah! Perfect! She's good for a new comedy coming up called Marriage Go Round!" Hollywood Sentinel: And so did things speed up for you then with him? Julie Newmar: They do, and at that point, if you're discovered, which you usually are in New York, where they keep an eye on things (…) then you become bi-coastal. And, low and behold, I had an apartment on Carper Avenue in Los Angeles, and on Eaton Place, in New York. Bruce Edwin - Hollywood Sentinel: That's great. I want to kind of skip ahead now- you did so much work there in between - but I want to come up now to the later work, that most of the world knows you for, and that is of course Catwoman. Now, what was this like for you, did you realize when you were doing this role how big of an impact it would have? Julie Newmar: I think the things one thinks about is creating the role, however, I knew it was brilliant because the writing was brilliant, a man by the name of Bob Kane, and Stanley Ralph Ross created the hour long shows that I did as Catwoman on the Batman series. It was innate for me, all I had to do was put on the costume and walk on the set. The costume in (their) words played the scene. Julie Newmar: (Laughs) You're right on both accounts! Bruce Edwin - Hollywood Sentinel: (laughs) …and that was that- I'll admit, I had a total crush on you! Hollywood Sentinel: (Laughs) That's great. 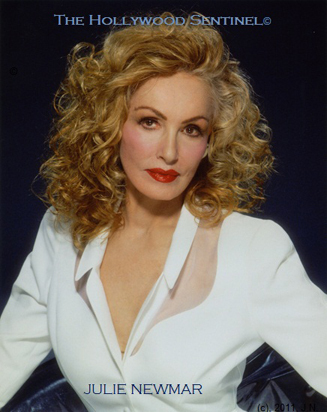 Julie Newmar: And I have just gorgeous stories, and I'm looking for more. It's going to be the new chicken soup book, of first fantasies, or virtual fantasies…I like that- virtual fantasies! Julie Newmar: Well, what would you like?! Bruce Edwin - Hollywood Sentinel: (laughs) Did you get a lot of backlash from parents at the time, who were against the sexuality conveyed by you in that role? Julie Newmar: Well, I was completely dressed! There were no four letter words! Bruce Edwin - Hollywood Sentinel: I know! Julie Newmar: Think about it now, think about it- you're not looking at what you see today- you're looking at highly charged, normal and natural energy between two people. Hello?! Hallelujah! Hurray! How neat, how purr-fect, and that was healthy! Bruce Edwin - Hollywood Sentinel: Now, I said the line earlier about gay and straight men, now why do you feel that you've been so embraced and loved in the gay community? Julie Newmar: Is it because I'm tall? Julie Newmar: You ask them! Do they want me to be Debbie Reynolds? I love Debbie Reynolds, but she's about five feet two! Bruce Edwin - Hollywood Sentinel: (laughs), is she? I didn't know that! Julie Newmar: Ooooh, well, would you want it to be? Wouldn't you want there to be me? Julie Newmar: Wouldn't you want a little stroking? And a little feline adulation? Bruce Edwin - The Hollywood Sentinel: Oh my! © 2011, The Hollywood Sentinel. All rights reserved. No part of this interview or images to be published in any form without express written consent from the publisher.